Galco’s Soda Pop Stop is a world-famous soda store. The owner and founder of Galco’s had a lifelong passion for all things soda pop, and wanted to collect as many varieties as possible in one place for a thirsty public. He took over an old supermarket and began ordering in every type of soda from every soda brewery, no matter how small. The end result is a can’t-miss haven of carbonated beverages. Along the back wall of Galco’s, inhabiting the area where a meat and fish counter doubtlessly one stood, is a small area where one can order one of a dozen sandwiches. My first couple of trips to Galco’s were naturally so focused on soda purchases that I didn’t even notice the sandwich counter there. Naturally, once I noticed it, it was added to my list. I have spoken before about sandwiches in unusual venues, so I couldn’t pass this one up. Most of the sandwiches on the board are labeled under the title “Blockbuster” — the Turkey Blockbuster, the Roast Beef Blockbuster, and so on — although the ingredients didn’t hold any clues as to what might be the blockbusting nature of said items. They seemed fairly straightforward and pedestrian (not that this is necessarily a bad thing). Luckily, I spied an item listed as “The Original.” If I’m going to try a sandwich from a soda stop, I may as well go with their first creation, mayn’t I? The Original is Italian dry salami, mortadella, salami cotta, ham, mayo, mustard, pickles, and provolone on a french roll.The menu takes care to note that The Orginial is the only sandwich served without lettuce and tomato. I felt this was an important distinction to make, and that the sandwich makers at Galco’s knew better than I what should appear on any given sandwich. 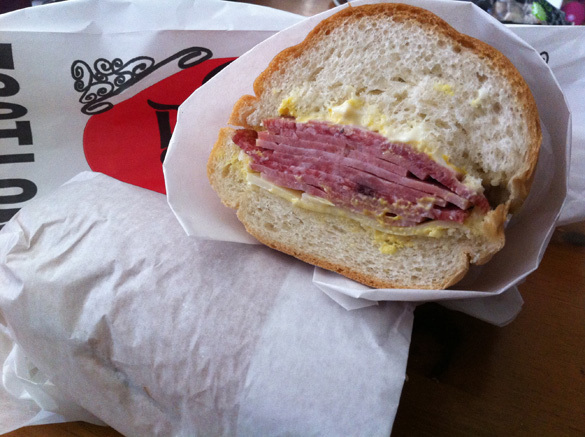 I want to take a moment to compare the sandwich at Galco’s with a sandwich from the Eagle Rock Italian Deli. At the Italian Deli, you get fresh-sliced meats and cold cuts that are carved to order and placed on a roll that is baked in-house daily. At Galco’s, you get cold cuts out of a package which are placed on a french roll out of another package. I’m not faulting Galco’s for not having specialty ingredients at a small counter in the rear of a defunct grocery store, but perhaps I am faulting them for the fact that their sandwiches are more expensive than those at the Italian Deli. The overhead on these sandwiches has to be incredibly low, particularly when the mustard in question is of the “yellow” variety. The sandwich was disappointing in several respects. The various cold cuts, which appear plentiful in the above picture, are bunched up in the center both along the length and width of the sandwich. The spongy bread, although perhaps the highlight of the sandwich, becomes 80% of any given bite beyond the first couple mouthfuls of either half of the sandwich. The other great failing of this sandwich, I believe, has much to do with the quality of the cold cuts used. Such a melange of cold cuts, were they freshly sliced and of a discerning quality, might be pulled off by the Italian Deli (although they usually, and wisely, stick to one type of cold cut per sandwich), but when you have four different types of cold cut all yanked from a package — packages undoubtedly emblazoned with “Oscar Meyer” or “Foster Farms” — and slathered in a hefty coat of mayonnaise and yellow mustard, without even lettuce and tomato (adamantly), the overall effect was that I was eating a bologna sandwich. I’ve eaten bologna sandwiches often during my lifetime, but I don’t believe I’ve ever paid for the pleasure of someone preparing one for me. And I’ve certainly never paid someone nine dollars for an unevenly-distributed bologna sandwich. The Original could save a lot of money by simply dropping the pretense and offering bologna sandwiches. Then they wouldn’t have to open four packages every day. They’d only have to open one. This entry was posted in General Sandwich Discussion, Sandwich Reviews and tagged Los Angeles, Reviews by Bill, Sandwiches I Have Eaten by bengrimm. Bookmark the permalink. Actually, everything is pre-sliced in the morning and all meats are 100% – no fillers! Because the meats have no fillers they are more expensive. Perhaps you are used to process meats? I stand corrected! I am “used” to a wide range of meats of varying qualities, but thanks for the clarification.